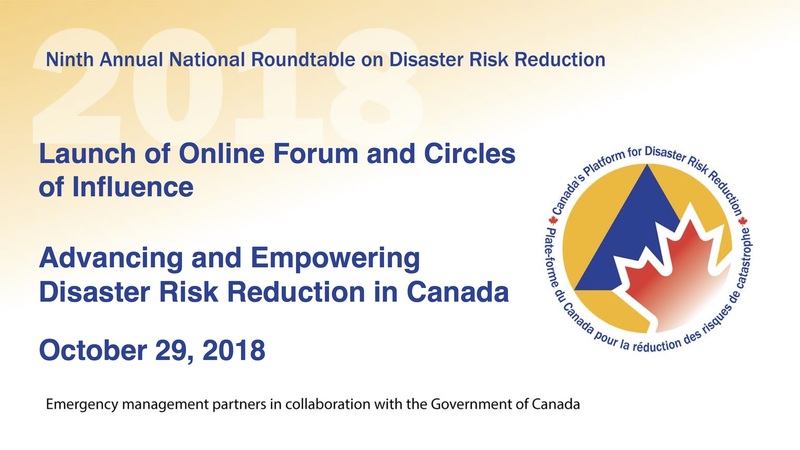 At this year’s Annual National Roundtable on Disaster Risk Reduction (DRR) held in Vancouver on October 29th, Public Safety Canada unveiled a new online forum on GCcollab—a new Government of Canada website designed to increase collaboration between government and stakeholders. GCcollab is a professional collaboration platform that is open to all Canadians by invitation. The online platform encourages innovative and collaborative ways of identifying and co-creating policy and research. The new GCcollab forum is intended to facilitate DRR-related discussions year-round and to provide a platform through which to advance Circles of Influence in emergency management. The forum contains a number of functions and interactive tools, including: polls, a discussion forum, blogs, group files, links, an event calendar, photo albums and more! For more information on the GCcollab platform see here.